"Green is a solace, a promise of peace." 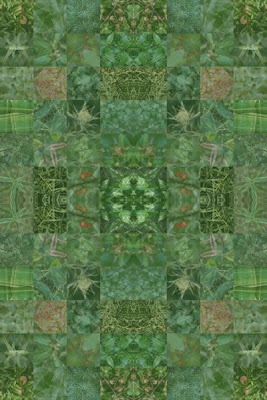 A quilt for the solstice season created from photographs of the evergreen plants growing in the garden. This gave me particular pleasure as it slowly grew into what I wanted it to feel like. Every year I take a cutting from each of the evergreen plants in the garden and place them in a silver bowl. I wanted to make a digital quilt to express the feelings I have as I bring the greens into the house. I started by going out into the cold and photographing each plant. Working in photoshop, I pulled out a square piece of each photo and combined the squares to make a quilt. Using the images as is made for a pretty pedestrian and dull piece. I then added a second layer of each square, rotated it, and made it opaque. Much better but it lacked an overall continuity. I placed a new layer over the entire image, filled it with green, and used the opacity to make it light. The light covering of green brought unity to all the different squares. I then did my favorite technique of bringing four identical images together and rotating them to form a symmetrical pattern. My inspiration as I worked was the music of Nowell Sing We Clear which I highly recommend for traditional music of the season.